Captools/net Pro and Enterprise versions support generation of management fee billing through the report generation process. Billing management fee rates and methodology are specified in the Captools/net fee rate records, and a fee rate class is assigned to each account in the account record. The billing report applies the applicable rate for the account to the reporting period specified to generate the fee reported for each account. If fee billing is to apply across several related accounts, these accounts can be computed together in a merged report to determine the applicable rate, optionally taking into account combined assets. Then the fees can be either allocated across the related accounts, or assigned to a designated account. A management fee summary report can be used to compute fees for all accounts you manage for transmission to a custodian. Rep Id - This ties the fee rate to a specific Captools/net user, allowing each user on multi-user systems to define their own fee class. When the fee report is run for a given account, the applicable Rep Id is extracted from the account's client record. Fee Class - This is a user-defined identifier for the fee class. The Fee Class specified in the account record (see Fee Class Assignment below), plus the billing report date determines which fee records are used in the fee computation. Date - This specifies the effective date of the fee record. A fee record of a given date will be used for computations of fees for that date and later until it is superseded by a later dated record of the same fee class. No Fee - No management fee is computed. Average Value - The average value of the account for the billing period is used as the Fee Basis. This average is computed based upon the account values at the start and end of the period, plus intervening transactions and valuations, pro-rating for the time assets were held. Start Value - The Fee Basis is the account value at the start of the billing period. If no assets were held at the start of the period, then the value on the first date the account was valued is used, pro-rating for time. End Value - The Fee Basis is the account value at the end of the billing period. If no assets were held at the end of the period, then the value on the last date the account was valued with assets is used, pro-rating for time. Advanced Fee - This method presumes that the billing date is the start of the billing period. The Fee Basis is the account value on this date. Adjusted Start Value - This method is the same as the Start Value method, except that a time-pro-rated adjustment is made to the fee basis to account for any account additions or removals made prior to the period end date. The prior period is defined by the prior fee rate record. Thus if your current fee rate record is dated 9/30, and your prior fee record is 6/30 then the adjustment will be made for transactions occurring between those dates. Adjusted End Value - This method is the same as the End Value method, except that a time-pro-rated adjustment is made to the fee basis to account for any account additions or removals made prior to the period end date, as define above for "Adjusted Start Value". Adjusted Advance Fee - This method is the same as the Advanced Fee method, except that a time-pro-rated adjustment is made to the Fee Basis to account for any account additions or removals made in the prior billing period,, as define above for "Adjusted Start Value". Note that this adjustment occurs with a one period lag. The Adjusted Advanced Fee method is popular with advisors because it ensures that they will be compensated for services for the period in which a client closes their account, while being fair to both the client and advisor by making a retroactive adjustment for additions or removals made after the billing date. Recon. Value - This method uses an account's value as stated in the Auxiliary/Reconciliation records as imported from your custodian. The date of the reconciliation data must be the same as the end date of the fee billing report, allowing for weekends and holidays. Using this method permits billing even though your transaction data in Captools/net may be incomplete and unreconciled, however since it does not use transactions, there can be no adjustments for addition or removal of funds, or for average values and this method cannot be used for incentive fees since account transaction history is required to determine profits. Fee Layering - Permits specification of either Flat or Layered. This is of significance only if there is more than one record for a given fee class on a given date. If Flat is specified, the fee record used will be that whose Minimum Amount is nearest to, but does not exceed the Fee Basis for the account, as computed using the specified Fee Method. If Layered is specified, the fee is computed by dividing the Fee Basis into layers at breakpoints indicated by the Minimum Amount field in the fee rate records and applying the rate specified by each record to its respective layer. Min. Amount - This specifies the base asset level of a fee layer. There are two ways fee layer can be applied (see below). Fee% - This is the annualized fee percentage to be applied for assets this layer. The actual fee percentage used in the fee computation will generally be time pro-rated. Tax Rate on Fee - This field allows you to specify the tax rate that your government imposes upon your receipt of the fees, e.g., the GST tax that Canadian advisors pay on management fee receipts, or excise tax that a local government may impose. If a tax rate is specified, the net fee will be grossed up to pass the tax on to the client. Min. Fee - This is the minimum fee to be charged, regardless of the computed fee. This figure is not time pro-rated. Service Charge - This is a separate charge that is added to any fee computed as a percent of assets. Sum Min Fees - Forces the summation of minimum fees when fees for multiple accounts are computed. When unchecked, the minimum from the fee master account is used. Month End Values Only - If the average value fee methodology is specified for an account, this results in the computation of the average value being made using month end values only. Days Per Year - This specifies whether 365 or 366 days are to be used for translating the annual fee rate into a rate for the billing time period. This parameter is not relevant, if you specify Assume Uniform Period (see below). Billing Months - This field is used to determine the length of the billing period if you specify an advance billing methodology. If do not use an advance billing method, the the length of the period is determined by the report period. High Water Profits - If you specify a non-zero incentive fee rate, this field is used to indicate whether you want to apply the "high water" profit methodology to protect clients from being billed more than once from being billed for profit resulting from a re-tracement of account value after one or more losing periods. Incentive fee billing is supported only at the Pro-3 and higher program levels. Assume Uniform Period - Checking this field indicates that a uniform billing period is to be assumed regardless of the actual number of days in the billing period. I.e., a 90 day quarter is to be treated the same as a 92 day quarter with the quarterly fee assumed to be 1/4 of the specified annual fee rate. Multi-Date Fee Detail - This specifies that if the reporting period spans multiple differently dated fee rate records of the same fee class, that all such records be used to compute the fee, and rather than just using the most recently dated fee rate records. This facilitates changing your fee rate structure mid-billing period. Accrued Fees - This specifies that accrued fees are to be computed when account valuations are computed. The accrued fees appear in the "Est. Accrued Fees" field of the valuation records. These can be optionally used during account performance reporting by checking the "Use Accrued Fees" option in the fee report special options. This is particularly valuable for accounts being charged an incentive fee which will not be billed until the end of the year, as it minimizes the distortion of after fee returns for period during the year(Level 4). Debit Account (Billing Account) - This field allows you to specify that another account be billed or debited for fees due by this account. For example a tax deferred IRA type account might have a taxable account owned by the same client billed, or a child's account might be billed to a parent's account. If the specified debit account cannot be found during the billing report generation, then the current account will be debited. If you change account numbers, take care to review that debited accounts correctly take account of the new numbers. The simplest way to specify the applicable accounts is to place an "asterisk" (*) in the billing account field, in which case all non-tax-deferred accounts for that client id will be debited a pro-rata share of the fee on the tax-deferred account. Or you can specify "*=family" or "*=acctgroup" to specify that all non-tax-deferred accounts in either a family or account group are debited. Billing Symbol - This is the ticker symbol to be used for this account if you opt to have management fee records generated when the fee billing report is generated. Discount% - This field permits you to specify that the fee for this account will have a discount applied on top of the fee computed with the specified fee class and fee method. This gives you the flexibility to negotiate fee rates with clients without the need to define and maintain a new fee class for them. This feature is only supported in higher level program versions. $Exclusion - This field permits you to specify the exclusion of a fixed dollar amount from the computation of the Fee Basis. This might be desired, for example, if a client wishes to maintain a fixed minimum amount of liquid assets on hand for which they do not feel they should be billed a management fee. The Security Id records and the Portfolio Securities records each contain Fee Factor fields. These factors are applied in computing the Fee Basis. Normally these factors are set to "1.0". However they may be set to a lower value, e.g. 0.50 to indicated that holdings in the indicated security should be billed at a lower rate, or they may be set at a higher level, e.g. 2.0 to indicate that the particular asset should be billed at a higher rate. If Fee Rate records for a Fee Class specify a "High Water Incentive Fee Method" and a non-zero "Incentive Fee Rate" in those fields, then the fee computations will include fees computed based upon profit earned since the prior "Incentive Fee" was charged. The dates of prior incentive fee charges is based upon prior Fee Rate records for the applicable account portfolio, thus if you use this billing type you must create a fee rate record for each date you bill the incentive fee. Management fee reports are used to implement fee billing. This provides the flexibility to bill the client and receive payment later, and/or generate fee records suitable for export to your custodian so they can automatically bill the client and credit your account. At the Pro 4 or Enterprise level you can also specify that fee transaction records be generated as a part of the billing report generation process so as to automatically debit client accounts for the billed amount. Several types of management fee reports are provided. A fee table, such as the following example showing the layered fee computation for a half year period, can be included with other periodic reports. The "User Text" portion of Captools/net's reports can alternatively be used to provide a "Billing Statement" type of report. A cross-reference version of the billing report called a Fee Summary, can also be generated to provide the billing information on all of your client accounts to a custodian so they can debit your clients' accounts and credit your account for the applicable fee billing amounts. The Fee Summary can be exported to a spreadsheet by opting for the Excel output format, or alternatively, in the case of some custodians, an export format specified by the custodian is supported by an option on the report special options control. Generate Records - This option causes fee transactions records to be placed in the transaction blotter when the report is run, using the transaction code specified. These records may later be transferred to the account portfolios or be exported from the blotter. 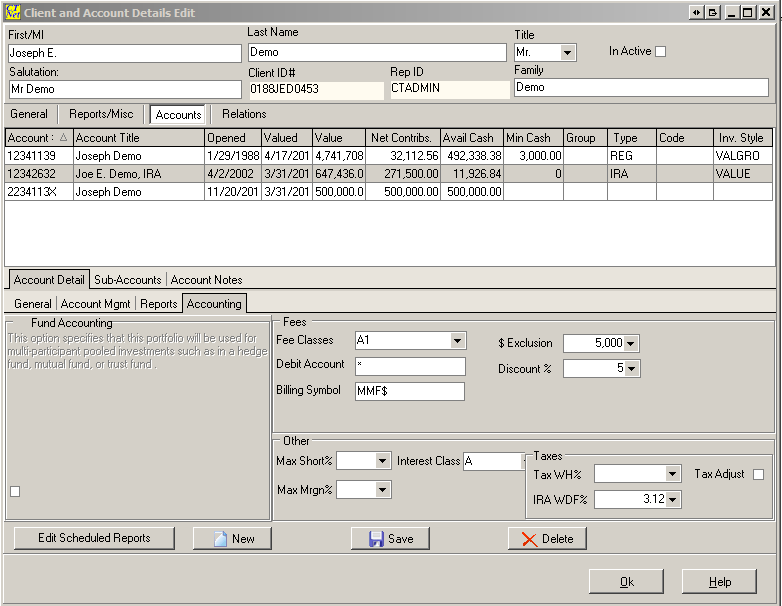 The applicable transaction symbol used is specified for each account in the Billing Symbol field of the account record. Use the "Bill Date" field in the fee rate records to specify a bill date other than the report run date. Prorate Service Fee - This causes a Service Fee to be prorated for the number of days billed. Service=% - This causes the service fee to be computed as a percent of the fee basis. This will also prorate the charge. This option can be used to break a management fee into two parts, a "management fee" and "other fee", for fee splitting. Profit TAC Exclusions - This allows you to exclude transactions based upon TAC code for purposes of computing the profit used to compute incentive fees. Separate TAC codes using commas, e.g. "MFE,MFD,MFS"
Base Adjustment TAC Exclusion - This allows you to exclude transactions based upon TAC code for purposes of computing deposit/withdrawal adjustments for fee methods that adjust the fee base for deposits or withdrawals. Enterprise level licensees of Captools/net may be managing a large number of accounts because they are handling the record-keeping and reporting for other advisors or reps. In these cases there typically may be a sharing of management fees. The Enterprise version of Captools/net accordingly provides several extra data fields to accommodate computation and reporting of the portion of the fee assigned to the sub-advisor or rep. 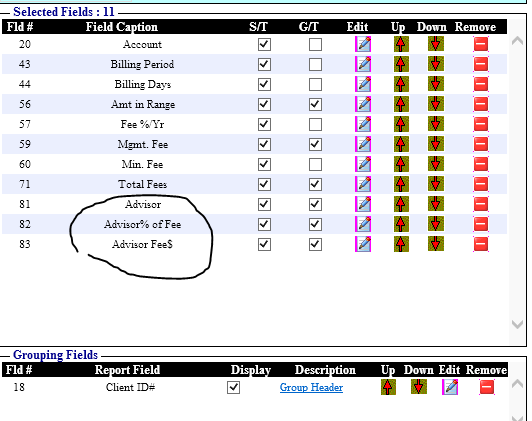 In the above case, when the report is run the client record will be used to identify the identifier to be used in the "Advisor Name" field of the report and the contents of the "Rep Fee%" field will determine the rate to be used to compute the fee share for the sub-advisor or rep.